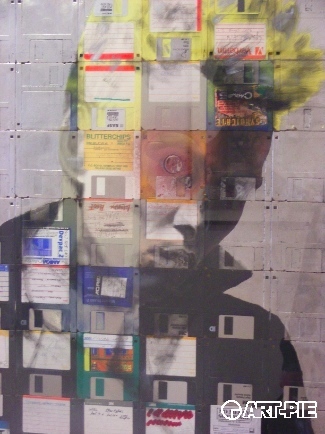 We are big fan of artists using what they can find around them to help them making art or in Nick Gentry’s case, using floppy disks to be his support for his art as well as being integral part of his end product – mainly portraits. Nick Gentry uses wood panels layered with floppy disks which he might paint or not, but one sure thing is that they are fully integrated in his pieces. Using the round bit of the floppy disk as the eyes is a recurrent occurrence in his art. Nick Gentry portraits all these imaginative or not, I do not know, characters which behind that scruffy brush stroke comes to live.